Terry Pratchett, author of the renowned Discworld series, lives with a diagnosis of a rare form of early-onset Alzheimer’s disease. 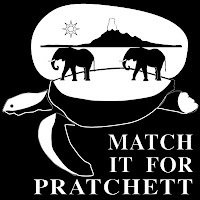 Pratchett recently donated half a million UK pounds ($1 million US) to the Alzheimer’s Research Trust in the UK, and this sparked a Match it for Pratchett campaign. In the US, donations (by phone, online, or by check) can be made to the Alzheimer’s Association. Imagine what could happen if each of us who have been delighted and inspired by his work gave one hour’s worth of pay to this cause. I invite readers of this blog to join me in donating that amount in honor of Terry and to combat this as-yet incurable disease.